In a prior blog post, I discussed the fine line between keeping your company communications professional, yet personal. I suggested that high-quality communications are a positive representation of your company, and a personal touch can really help to draw in your audience so that they make a connection with your company. This balance is extremely important to maintain and can make a big difference in your marketing efforts. Today, I’d like to take this a step further and talk about how to communicate effectively with your target audience. All too often, companies miss the mark when talking about their products and services by not realizing that their audience may not have enough background knowledge to understand their technical terminology. Even though your engineers and scientists may be able to explain company concepts most accurately, it’s important to “translate” this information into common, everyday language. Acronyms can be exhausting. Even though the employees of your company may have them down pat, you cannot expect your customers to remember all of your acronyms. If you are going to use them, be sure to define them clearly and often. Limit the number of different acronyms you use. Focus on the most important ones, and build recognition by repetition. Internal company lingo or made-up words are cool, but they can also be confusing! If you’re trying to get a new word to pick up traction with your target market, be sure to introduce it in a clever way and use repetition to make the word stick. Eventually, it will hold some value – if you position it correctly. Use examples, especially ones that give your audience a mental picture of what you’re talking about. Some people learn best by visualizing. Photographs, diagrams, and videos do a great job of saying a lot in a short amount of time. A picture is worth a thousand words! Step outside the box. Or rather, step outside of your company’s four walls – and into the shoes of your audience! A marketing or sales pitch that makes perfect sense during an internal planning meeting may not make a lot of sense to a stranger on the street. (Have you ever seen a commercial that just made absolutely no sense to you, or was so off-the-wall that it actually made you not want to buy the product or service? That’s the kind of thing I’m talking about.) Do your research, test out your pitches on your target audience, and listen to their feedback. It can be very valuable. Ask for help. Find someone on your team who is really good at taking technical, difficult-to-understand concepts, products, and terms, and have them help write the “everyday language” version of the information. This person should be involved with your marketing and public relations team as well. Then, leave it to the experts! Your marketing team (whether internal or external) will be able to communicate your information even more clearly. Often times it helps to have someone not associated with the company do the majority of your writing. Because they have to first understand and grasp your concepts in order to write about them, they do a great job of putting it in a way that anyone will understand. If you keep these tips in mind when preparing your sales and marketing communications, you will certainly notice a better response from your audience which will translate into more success for your company. Not only do we want to keep our communications personal enough to be engaging and professional enough to garner respect, but we also want to speak appropriately and effectively to our audience. Stay tuned for more communication tips in the future! For this week’s blog post, long time colleague, friend and content marketing expert, Rachel Medanic, is back again to help our readers overcome the challenges of delivering on a robust and engaging content marketing plan for 2013. Rachel has been a marketing pro for over 15 years and is currently is a Client Services Manager for PublishThis. So you’ve started down the path of content marketing and tackled some of the low hanging fruit but are now experiencing an idea shortfall. Where do you turn to re-ignite your efforts? First, get perspective. Content Marketing Institute, MarketingProfs and Brightcove recently teamed up to produce some data driven insights now published in the 2013 B2B Content Marketing Benchmarks, Budgets and Trends – North America report. You are not alone: volume, variety and quality of content are key areas where B2B marketers struggle. 64% say they can’t produce enough content, 52% struggle to create engaging content and 45% say maintaining variety is also a key challenge. In October, I shared how marketers in every industry (B2C and B2B both) are being affected by the sharp rise in content marketing as a practice. Companies are becoming publishers to more effectively engage audiences. Here are some insights and observations to get you back on the idea generating track. #1 Individuals are the content consumption baseline. Jeff Dachis, recently wrote for Ad Age, “You don’t build brands at people, you build brands with them.” People are savvy enough now to be offended by push marketing. Growing up in the 70s, the brands I recall that were pushed at me included things like print ads for vodka and Joe Camel cigarettes. Brands were most certainly being built at me, not for me. B2B marketers should focus on the similarities they share with B2C marketers because ultimately, relationships are built with individual people. And those people have the same content expectations that B2C target audiences do. Business audiences may rank content that informs higher, but “edutainment” (educational/informational/entertaining content) is definitely a way in. #2 Whenever an online conversation is started, marketers—especially in small or mid-size companies—are now often responsible for responding. Marketing used to be built on the premise of content interrupting the target customer. But your target customer now has the power to interrupt your business with their voice. Should marketing really be responsible for answering? The job role lines have blurred over time, but what is clear is that whoever answers should engage the customer wherever they are (e.g. Twitter, Facebook, or some other online community). Provide a public, professional response in a reasonable time. #3 Make your content an opportunity for customers and business partners to co-create something great. This summer, I participated in a flash mob with a local dance studio where I take classes. The event created something fun we could all engage around, escalated our brand loyalty to the business and built our sense of community. Leading up to the day of the mob, all the instructors integrated learning the choreography into their classes so that on mob day we became part of a surprise experience at one of the city’s biggest farmer’s markets. How can you create the digital equivalent of a “flash mob” for your business? Who can you get involved? Make sure everyone has skin in the game—figuratively speaking. #4 Content should be free. SAP’s Michael Brenner articulates an important reminder for marketers, “Content is currency — something we trade for our audience’s attention. That currency becomes more valuable every time it’s shared by someone other than ourselves.” If your business is providing content such as online education, find a way to offer some of it for free to entice the buyer—and make it shareable. Curb your pay walls and over-eager newsletter sign up splash screens. Trying to force a relationship can turn your audience away forever. If your audience feels your content is valuable, they will share it. They may even pay for it if they can’t get it anywhere else. #5 Your content may be helping your audience make sense of their world. Big brands are turning to publishing and the technology for every company to become a publisher is definitely available. So why not watch what publishers themselves are doing? The New York Times (among many others) are using social sign-on to foster new dimensions of engagement on their web site. I can see the articles my Facebook friends have recently read and from this I learn more about my particular friend’s (name obscured in this visual) enthusiasm for this publisher (plus I’m also encouraged to go read what he or she read—one article closer to the 10 free articles per month pay wall). Facebook social sign-on has led the way in B2C. For B2B, Linkedin can be a great way to gather community around your content. If you don’t have your own online community, Linkedin Groups can be an excellent channel. Brainrider.com has a nice article on how to use Linkedin for your brand. #6 Your content can be delightful! The famous DollarShaveClub.com example came to me through one of my favorite bloggers Rohit Bhargava. Have a laugh once, but then go back through and see how you’d re-script and adapt it to the essence of your own industry. What business pain points (no pun intended) can you “set the record straight” on? I’ll use the hypothetical of a management consulting services as a challenging example. Is there a tongue-in-cheek video about some hypothetical C-suite leader who desperately needs your services? You can be creative and gentle. Your industry might be mired in stodigy content. If you’re willing to take the risk, the rewards for a fresh perspective can be great. #7 Measure everything you possibly can. The number of shares, Likes, and Tweets, in addition to dwell time, return visits and clicks through to additional pages on your web site are good indicators of content engagement. Onlinebehavior.com has a video and writeup to get you thinking creatively about aspects of content marketing that you can actually measure. #8 Beware the unintended! Usually I’m very receptive to companies creating content around adjacent customer interests. That’s exactly what 76 did. In my case, it had mixed results. I may not have been the target demographic. While fueling up recently at one of their gas stations, a sign advertising the latest in a series of mobile apps called “The Quiet Game” was above the pump. The game was positioned as ideal for my children to use in the car—because I have ears. “We’re on the driver’s side” read the tagline. All at once it struck me as weird, devious, and yet well-crafted content marketing. The persona 76 constructed about my “driving life’s” adjacent problems (beyond needing gas), assumed I had a smart phone, kids and a need for silence—respite from mobile games in the car. So they created a silent app to replace what they assumed my kids were already using. What they got wrong is this: my kid isn’t glued to a mobile device while in the car. 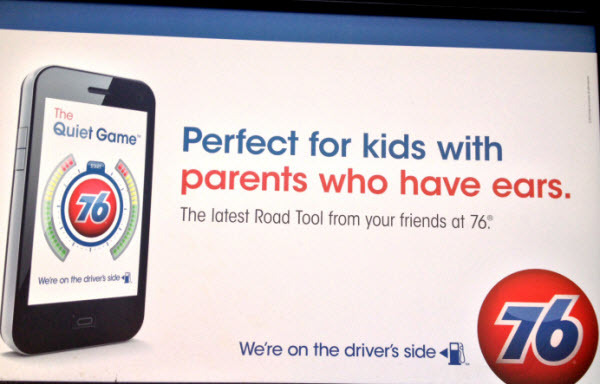 For parents of whatever age children 76 is targeting, I still can’t decide if 76 is inadvertently insulting its target customer’s parenting skills by implying that their kids are glued to noisy games while in the car. I personally can’t overcome my hesitation to download an app from a gasoline company. May great content be with you! What is Cooking Thought Leader? For this week’s blog post, I’ve asked long time colleague, friend and content marketing expert, Rachel Medanic, to help our readers understand how companies can demonstrate thought leadership through content marketing in today’s digitally overloaded world. Rachel has been a marketing pro for over 15 years. Have you ever visited a house being shown for sale and you walk in to the smell of cookies baking or a scented candle burning? The realtors are using a form of content marketing to engage your olfactory senses (and influence your visit with content). How humans perceive scent is closely connected to how the brain processes emotion and associative learning. Making a house “smell like home” could help persuade a potential buyer. Because of the explosion of media and a dramatic shift in audience expectations around content, content marketing is experiencing huge growth. Audiences have now come to expect good, free content—regardless of industry. B2B companies are as much on the hook to provide as B2C companies. Last month, Lorraine shared a number of good strategies for ways to transform your company into a thought leader. A few days ago Content Marketing Institute founder Joe Pulizzi shared 7 Content Marketing Strategies for 2013. #3 on his list was “A new mindset: Become the leading informational provider for your niche.” Think thought leadership. Pulizzi says brands aren’t taking their content seriously enough. Among 1,000 companies he surveyed, just 5% had a content marketing mission statement (an editorial mission defining why they were doing content marketing). So what? If you don’t know why you’re producing content, you probably won’t be satisfied with how your audience responds. Also this month’s eConsultancy Content Marketing Survey Report found that just 38% of companies have a content marketing strategy at all. Making your company an industry thought leader is nothing new. What is new is the digitally overloaded world in which this practice has resurfaced. The eConsultancy report found 90% of marketers believed content marketing would become more important over the next 12 months. The odds of getting noticed are slimmer because media is a fire hose and audiences want just a sip. Thanks to the proliferation of social media, anyone can become an overnight authority. It’s more noise and distraction than marketers have ever had to compete with before. Content has to be relevant and in many industries, it must also be fresh. It has to engage by educating, informing, entertaining or a combination of all three. Companies that can do this and add the touch of their own brand perspective on top will find themselves more likely to be in the spokesperson position rather than just another company in the business. What are your adjacent content opportunities? How can you pleasantly surprise visitors to your Web site? If you know your industry well, it just takes a little creative thinking to uncover the answers and transform them into something that can be digitally consumed. http://attainmarketing.com/wp-content/uploads/2012/10/cooking.jpg 1500 3000 Lorraine Kauffman-Hall http://attainmarketing.com/wp-content/uploads/2016/05/attain-logo-reverse.png Lorraine Kauffman-Hall2012-10-16 18:14:042018-02-07 22:09:14What is Cooking Thought Leader? Content marketing is about creating and distributing informative content that will help to convert prospects into customers and customers into repeat buyers. The goal is to gain opt-in permission from relevant target audiences to continually deliver content via email or other social media channels. Ongoing exposure fosters a relationship that provides multiple opportunities for conversion versus the “one-shot” all-or-nothing approach of traditional outbound marketing practices (such as, online ads, tradeshows or cold calling). Ultimately, the success of your content marketing plan hinges upon your ability to deliver content with independent value that builds trust, credibility and authority for your business. If you don’t have a robust content marketing plan in place, now is the time to get one. Recent changes to the Google algorithm along with announcements that YouTube is entering the content creation game and Gmail’s addition of Smart Labels, which automatically sort out any kind of mass mailings highlight the fact that a sound content marketing plan has shifted from a “nice-to-have” to marketing essential in 2011. YouTube Becomes a Creator of Content If the changes to the Google algorithm isn’t enough to convince you that content will rule supreme in 2011 and beyond, then perhaps you will be impressed by the fact that YouTube has allocated $100 million to pay for the development of its own original content. This is no small bet. While the move was surely motivated by a desire to generate more profits from ad dollars, the interesting takeaway for B2B marketers is that online consumption of content is increasing and the playing field is leveling as consumers move away from traditional media outlets to whatever sources provide the best content. Gmail Allows Users to Give Email Marketers the Slip Google’s move to allow Gmail users to automatically filter out all bulk mailings (classified as any kind of mass mailing, including newsletters and promotions) emphasizes the fact that consumers are growing tired of the deluge of email. After years of spam and over zealous email marketing programs, consumers are looking for ways to reclaim control of their inboxes. Employing tricks to avoid the spam filters will no longer be sufficient. Moving forward, email marketers are going to have to earn their keep in the inbox or risk automatic exile into the dreaded bulk folder. If you care about search engine rankings, Google has sent the message loud and clear, you better start paying attention to the quality of your online content. Sites that specialize in quality niche content (original and in-depth information on a focused topic) now rank better than sites with broad content on hundreds of different topics. This provides a great opportunity for B2B marketers. To capitalize on this shift, first consider what keywords define your business, then carefully evaluate every page on your site and get rid of the junk. Low-quality pages will hurt you – no matter what’s on the rest of your site. Next, focus on developing targeted content that is useful (let your keywords be your guide as to what is useful) and well written from top to bottom. If you can’t write great content yourself, hire someone who can. The corporate website is often a company’s most tangible and visible face to the world. When properly executed, a website can become a powerful marketing tool that not only serves the needs of existing customers, but also provides an opportunity to capture new customers. To support your content marketing strategy (which relies on opt-in permission) your website must effectively engage visitors. Ask yourself the following questions: Are users encouraged to opt-in to marketing programs? Is a clear call-to-action present on every page? Is there sufficient incentive to opt-in? Remember, incentive is driven by the value of the content presented and trust in your ability to continue to deliver value. If possible allow users to select topics of interest and frequency of communications as part of your lead capture process. Finally, bypass bulk mail filters by reminding users to add your distribution email addresses to address books. Once granted permission to engage prospects via email or other social media channels, be sure not to disappoint. Continue to provide relevant and meaningful content on a regular basis. Marketing automation tools help you categorize leads based on interests and actions so that you can continually provide targeted and relevant content. A “one-size fits all” approach can hurt your content marketing efforts and increase opt-out rates. Marketing automation tools offer you a wealth of information on demographics and response rates that should be used to guide your content development and distribution strategy. Pay specific attention to which types of content and topics perform well for each list segment so that you can adjust your strategy accordingly. A solid PR strategy that includes traditional and expanded social media engagement practices can help extend your reach. Remember that the purpose of content marketing is to engage prospects. PR announcements and media coverage can be used to create awareness and start the dialogue, but two-directional social media communications should be used to further develop the relationship. As Lorraine emphasized previously in her “Thought Leadership 101” blog post – to maintain the relationship, you must continually demonstrate understanding of the key issues, challenges, needs and requirements that truly concern your prospects versus spout off about your latest products functions and features. Use your SEO keywords as a guide on which social network conversations to join. Times have changed and so must you. Now more than ever, it’s time to re-evaluate your content marketing strategy and make a plan that will ensure favorable results based on solid content and intelligent strategy. We’re several years into the era of “Marketing 2.0” and I’m still surprised at the number of B2B technology companies that have not modernized their marketing approach. Just take a look at the websites of so many technology companies, small and large, and it clearly looks like they are stuck in the early 2000’s – or even (gasp)… the 90s. While I don’t believe in doing trendy things just for the sake of doing trendy things (a.k.a. keeping up with the Jones’), I do believe it’s prudent to take stock of the most current marketing tactics – learn what’s working for companies in the same industries you serve – and implement the most impactful changes. For decades now, marketers have been focused on traditional “outbound” marketing programs such as television and radio advertising, trade shows, direct mail, online banner displays, pop-up ads, email blasts and the dreaded telemarketing, to name a few. However with the advent of social media marketing and the social web, a dramatic shift has occurred. Today’s customer no longer wants to be “sold” – instead they prefer to find products and services online on their own or through friendly referrals. This shift is called “inbound marketing” and focuses efforts on web optimization, content marketing, social media optimization and customer referral programs. Here are some basic tips that should help bring you up to speed on 2011 marketing must-haves and provide a solid foundation for inbound marketing success. The corporate website is often a company’s most tangible and visible face to the world. When properly executed, a website can become a powerful marketing tool that not only serves the needs of existing clients, but also provides an opportunity to capture new customers. Search engine optimization (SEO) is the process of making sure your business website is properly categorized in the search engines (especially Google) and comes up high in the search results. Another big ingredient of SEO is link building, or getting other relevant sites to link to yours. Although it has been around for years, SEO is still critical in making your business more findable on the Web. It is a long-term strategy, however, and the results may take time to kick in. We’ve said it before but “Content is King”. Content marketing is about creating demand through compelling, highly relevant content. This is includes white papers, strategy guides, blogging, infographics, contributed articles, podcasts, videos, data surveys, news articles — anything that offers value to your target customer and helps differentiate you in the marketplace. This content, especially blog posts, gets picked up by the search engines and can help fuel your social media strategy. Social media sites and associated spam are growing in volume every day as new-bees jump on the social networking bandwagon in hopes of growing their network and making a splash – or at least being heard. The key to successfully leveraging social media is to define the most appropriate channels and best ways to engage key audiences in the right environments, at the right time, with the right messages. This may include the major social networks (Facebook, Twitter, LinkedIn); specialty networks, such as Biznik; local directories, such as MojoPages.com and Kudzu.com; social bookmarking sites; video platforms; article directories and blog and forum comments. Word-of-mouth marketing is arguably the most powerful way to market your product or services. As discussed in a previous blog post, customer testimonials can greatly enhance the credibility of a company and result in increased sales, media coverage or add the fire to your viral social media campaigns. When customers talk favorably of your product or service, they send a free, credible and targeted marketing message. Customer endorsements can be used in one or more of the following marketing mediums: media/analyst outreach, collateral, social media and/or inclusion on the website. It’s 2011 and marketing has changed, even in the world of B2B technology. Your customers have different expectations about how they want to find, buy and validate products. If your marketing tactics haven’t kept with the times, you may be missing out on lucrative sales opportunities. The good news is… it’s not too late to adopt an inbound marketing game plan to extend your marketing reach and win more business.